8.005 Striped Leaf-cutter (Phylloporia bistrigella) mines and larval cut-outs on birch at North Dean wood, Sept. 2nd 2017. 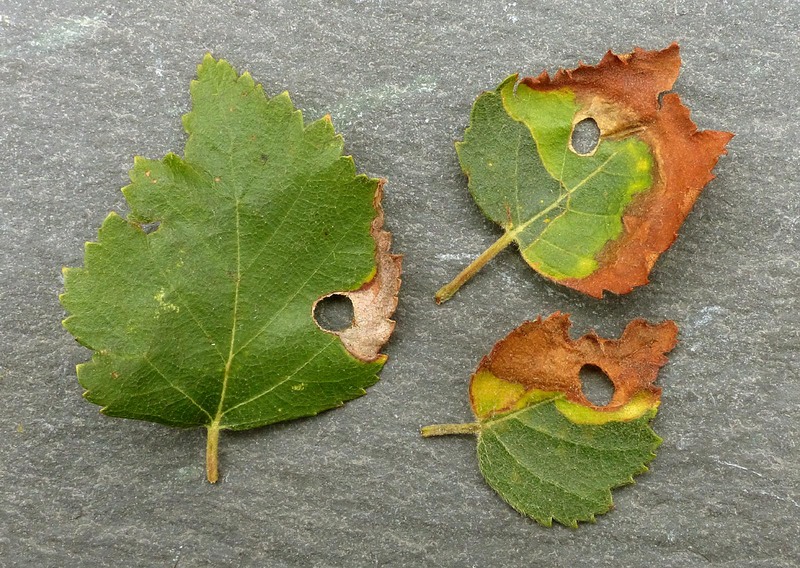 8.001 Pale Feathered Leaf-cutter (Incurvaria pectinea) mines and larvae in Downy Birch, Norland bilberry slopes, May 27th 2010. Each leaf usually has several mines. 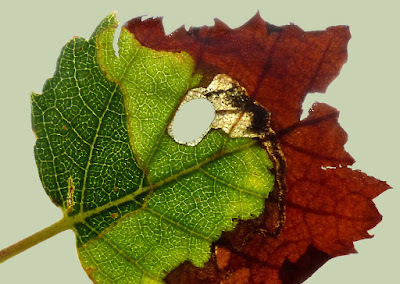 8.001 Pale Feathered Leaf-cutter (Incurvaria pectinea) mines and larvae. A back lit shot of one of the leaves pictured above. 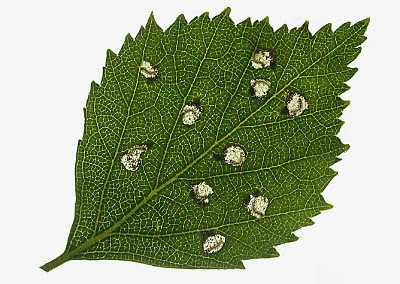 Ten mines, all tenanted with feeding larvae. 8.001 Pale Feathered Leaf-cutter (Incurvaria pectinea) - male, Norland bilberry slopes, May 4th 2010. Captured by day. One of the few micros with pectinate (feathered) antennae. 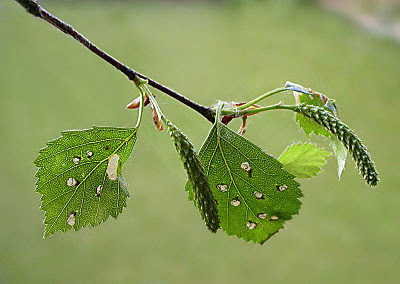 Reasonably easy to find amongst the Downy Birch here. 8.002 Feathered Leaf-cutter (Incurvaria masculella) - male, in the garden, May 18th 05. A field observation. 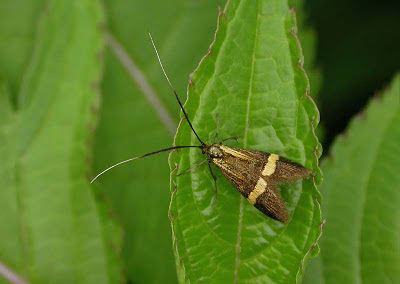 7.015 Large Long-horn (Nematopogon swammerdamella), North Dean wood, Apr.22nd 2011. Captured by day. 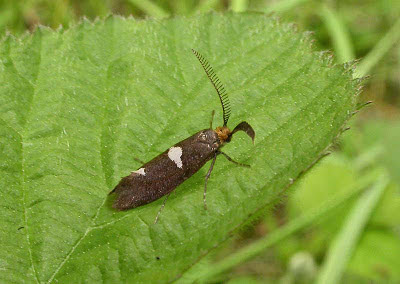 Wingspan 21mm - the largest of the longhorn moths. 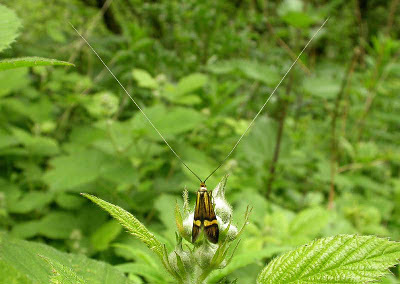 7.001 Yellow-barred Long-horn (Nemophora degeerella) - female, North Dean wood, June 26th 06. 7.001 Yellow-barred Long-horn (Nemophora degeerella) - male, North Dean meadow, June 6th 05. 7.006 Green Long-horn (Adela reaumurella) case and larva, Long wood, June 2nd 2014. 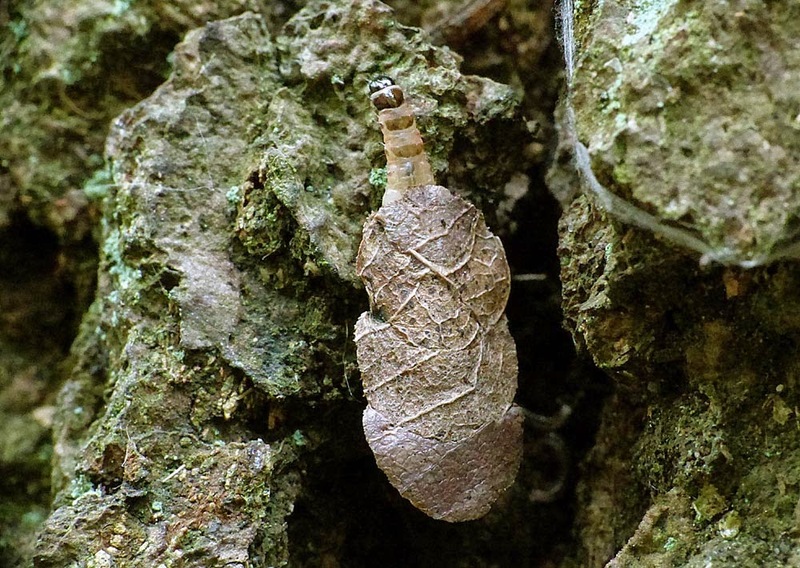 Taking in to account the size, shape and construction of the case and the sclerotized larval plates I strongly suspect it to be of this species. 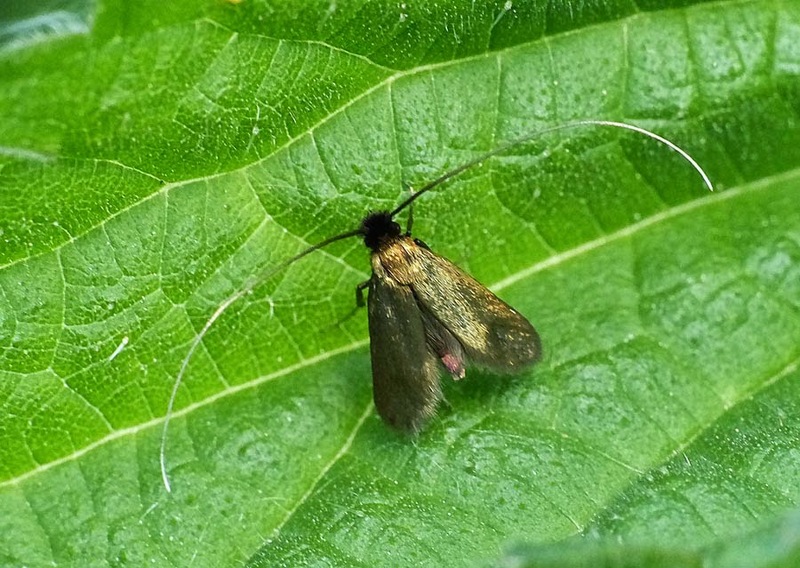 7.006 Green Long-horn (Adela reaumurella) - female, North Dean wood, May 8th 05. A field observation on oak. 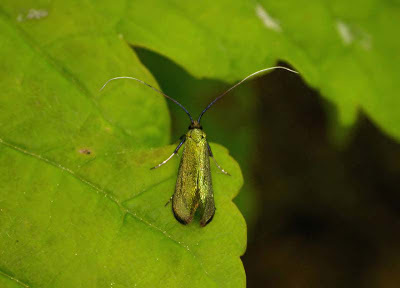 7.006 Green Long-horn (Adela reaumurella) - males, North Dean wood, May 23rd 06. 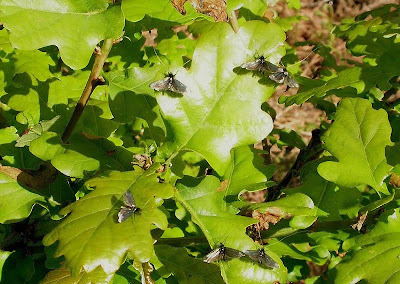 Males, with their longer antennae are dancing in the warm spring sunshine around oaks. Presumably it's a visual display to attract females. 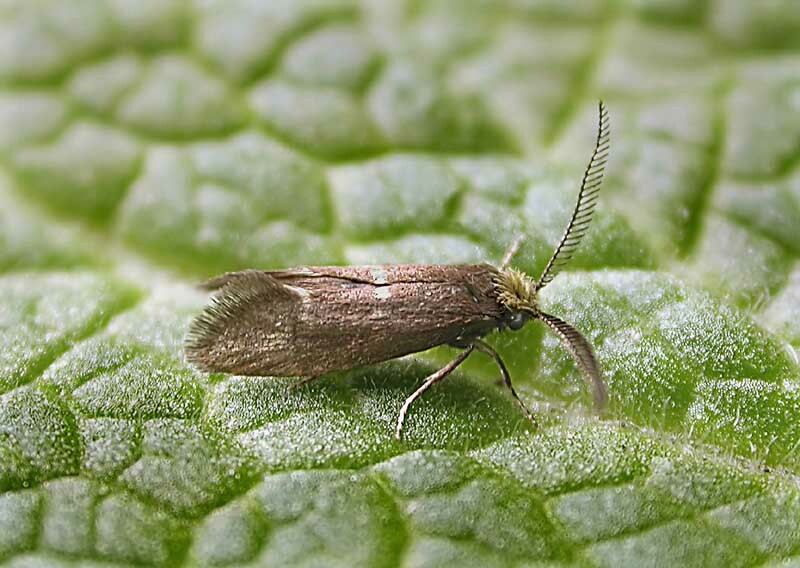 7.010 Meadow Long-horn (Cauchas rufimitrella) - male, a field observation on Bramble, the former sewage works at West Vale, May 21st 2014. 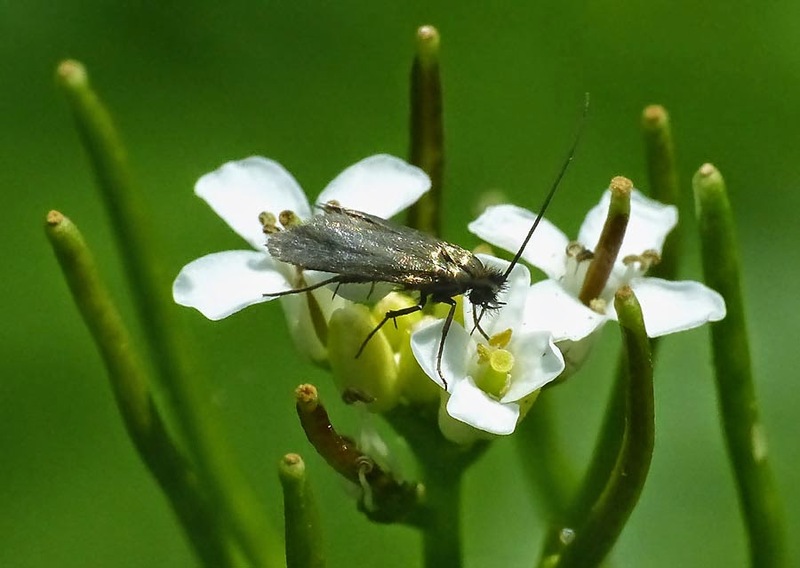 Easily mistaken for a fly with long antennae (yes, I did), it has a forewing of around 5mm. This male has antennae twice the length of the forewing. 7.010 Meadow Long-horn (Cauchas rufimitrella), details as above. There were around six individuals noted flying in the hot sunshine - usually around their foodplant Garlic Mustard. As with the moth above it's quite worn and lacking the orange tuft on the top of it's head. 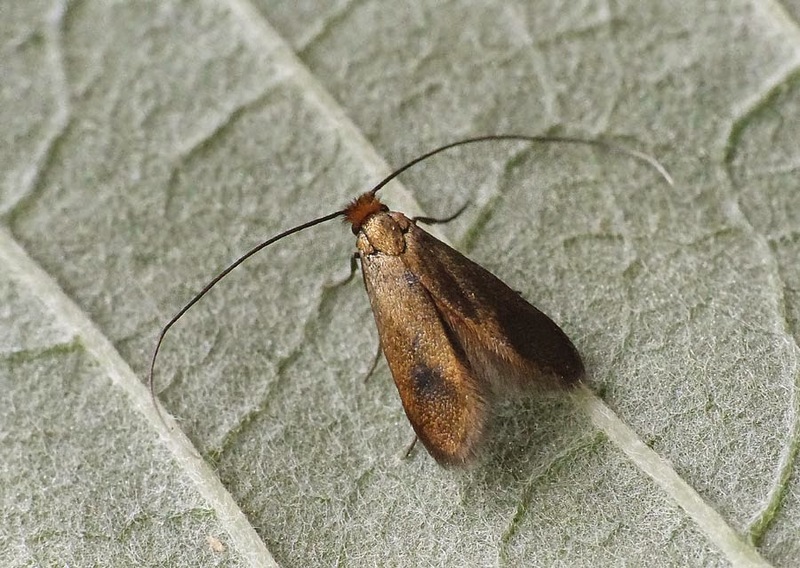 7.010 Meadow Long-horn (Cauchas rufimitrella), following on from above, I netted one specimen to examine and photograph in less harsh sunlight at home. 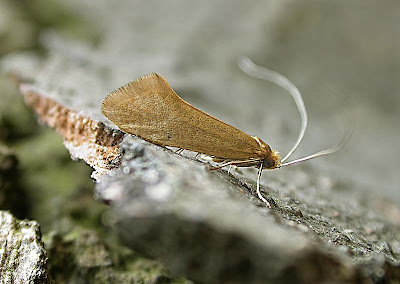 The distinctive orangey crown is visible in this less worn moth.